The number of Danes killed in traffic in 2014 looks to be one of the lowest since monitoring began in the 1930s. The number of accidents involving right-turning trucks has decreased immensely as well. The Danish Road Directorate’s prognosis indicates that the number of Danes killed in traffic in 2014 will be around 170. This is a significant reduction compared to 2013 where 191 people were killed in traffic in Denmark. The Road Directorate is awaiting the final numbers from the Police, but it seems safe to say that 2014 will end up close to the 2012 record of only 167 traffic-related deaths. “We have really debated people’s conduct and manners in traffic, and I am convinced this has helped,” he says. The number of killed pedestrians also looks like it will decrease significantly compared to 2013, most likely around 50%. In total, 22 cyclists and 12 pedestrians were killed in traffic in Denmark in 2014 compared to 84 car drivers. The numbers were calculated on December 20, 2014 by the Danish newspaper Politiken. 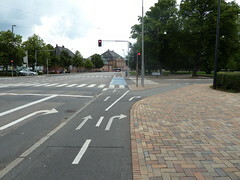 The Danish Road Safety Council, the Road Directorate, the Police, and Danish Transport Authority all agree that the low numbers are due to a more combined effort of all the organisations. Other factors include safer roads, a stricter legislation regarding drunk driving, more control and new safety technologies. According to the Danish Traffic Safety Commission, the number of traffic-related deaths should be reduced to 120 in 2020. This article is a resume and translation of an article from the Danish Cyclists’ Federation’s website www.cyklistforbundet.dk.